Prevent Bio Fouling. 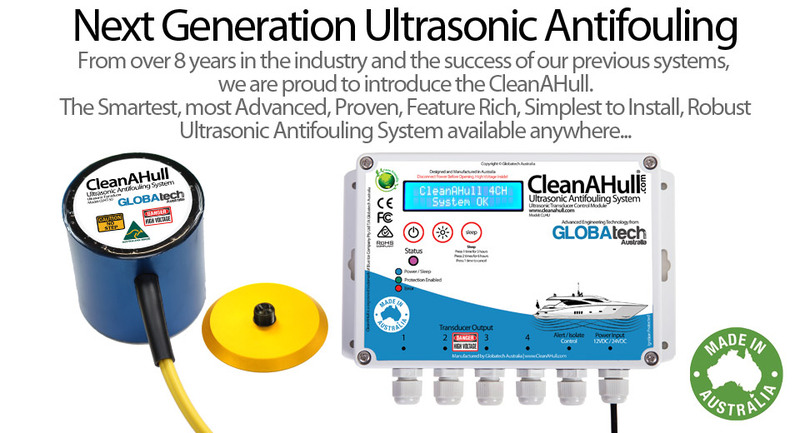 The CleanAHull Ultrasonic Antifouling System destroys algae and prevents bio fouling. Simple Install. Proven Tech. 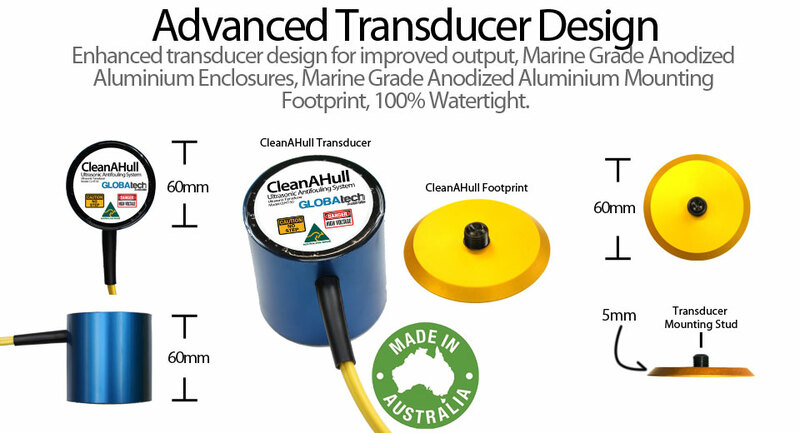 Installation is very easy with our patented Transducer footprints. Worlds most advanced digital Ultrasonic Technology, quality made in Australia. 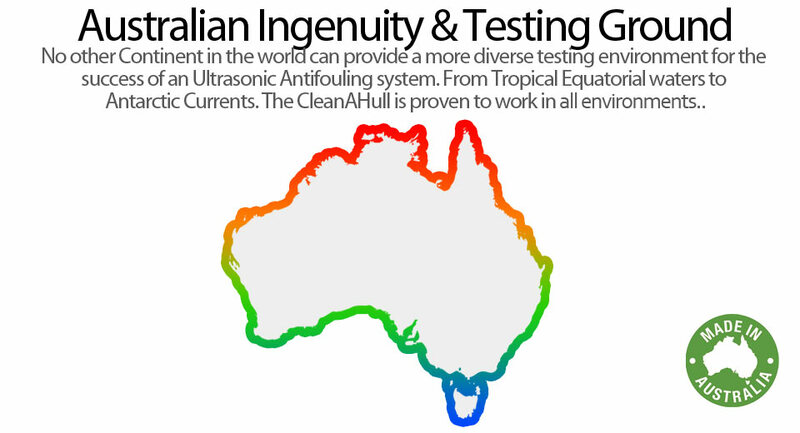 Improve Fuel Efficiency The CleanAHull system maintains a hull clear of algae and barnacles. Improving performance and fuel efficiency. Our System boasts twice the output of the competition. 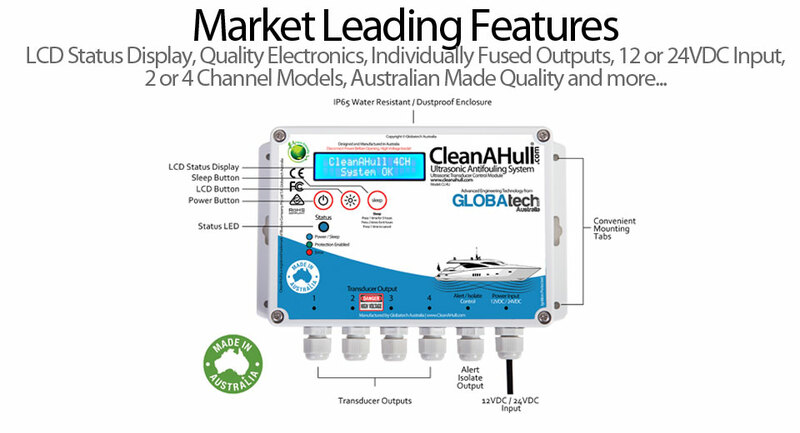 Ultrasonic Antifouling, Dual and Quad outputs available. Up to 15% Savings on running costs. Clean Hull equals reduced drag! This along with the fact our unit’s are the most affordable system available, makes for a winning combination. Our units are designed for safety. Temperature protection. Independent Output Control. Current Monitoring. Advanced Power Filtration and more. 12VDC or 24VDC Input. Our system will automatically take 12 or 24Volt input and provide the same quality protection! Active Current, Output, Temperature, and more monitoring. With instant compensation and automatic variable output control. While providing realtime information on the built-in LCD Display.